These actuators operate pneumatically various plant valve series in response to a variety of pneumatic input signal. 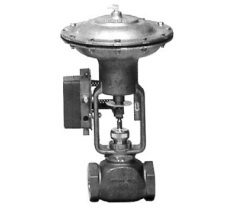 The V-400 and V-500 Series Pneumatic Valve Actuators are designed to accurately position valve modulating plugs in larger chilled water, hot water, and steam control valves in response to a pneumatic signal from a controller. 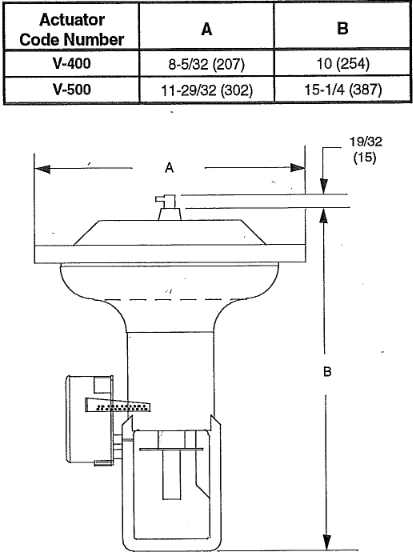 A valve positioner can be ordered separately for use in applications where sequential operation is desired or additional positioning power is necessary. These actuators have a molded, synthetic rubber reinforded diaphragm contained in a sturdy metal housing that protects against dirt and damage. * Use of V-400 Actuators on 1/2 or 3/4 in. brass trim valves is not recommended. High shutoff forces may cause damage to resilient seats.